The following picture illustrates the CMMI Continuous Model Structure. Each representation has its advantages over the other, some organizations use both representations to address particular requirements at various times in their improvement programs. 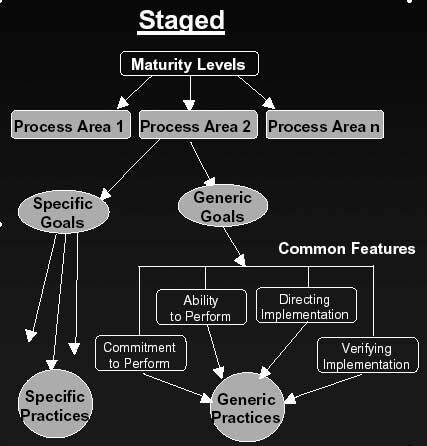 Organizational maturity is the focus of the staged representation, whereas process area capability is the focus of the continuous representation. 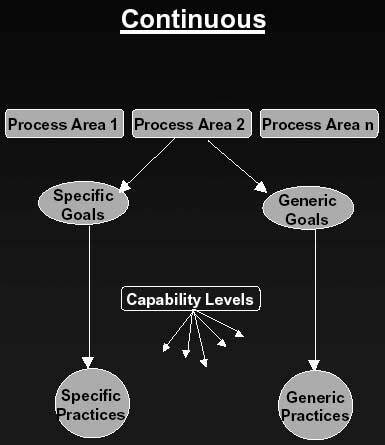 Organizational maturity and process area capability are similar concepts. The difference between them is that organizational maturity pertains to a set of process areas across an organization, while process area capability deals with a set of processes relating to a single process area or specific practice. The following diagram depicts both the presentations. In this diagram, MLindicates Maturity Level and PA Indicates Process Area.